If something doesn't look right, please get in touch. If you like getting your hands dirty and would like to dig into this yourself, we hope the following walkthroughs will help. Note, there isn't much to set up for Google or Basecamp sources, so not much can go wrong. Salesforce and FileMaker data sources have a lot of options, though, so you'll see common issues for those sources below. If you're logged in a less than a system administrator, it may be that your user privileges don't include authorizing new apps: you'll want to ask a system administrator for help. If you are a system admin the Salesforce might just be getting confused between your single-sign-on and sandbox logins. To fix this you can change the Connected App settings to pre-authorize by profile, and that will bypass the authorization step. Infomation on how to do this can be found here under "Authorizing Users." This is likely because your network is blocking the dayback.com domain. To doublecheck, try and open http://app.dayback.com in your browser. If you don't see a login page, then your network is blocking the domain: ask your IT department to "whitelist" dayback.com and you'll be all set. The most likely reason for this is that something in your Field Mapping isn't pointing at a field in your Salesforce table. A common example is that you've mapped to a custom field but haven't used the Salesforce name for the field in field mapping: custom fields will have a suffix "__c" so your field "SomeText" will be named "SomeText__c" in Salesforce and that's the name you should use in field mapping. Modifying campaigns requires that the user is assigned the "Marketing User" permission. Visit your permissions in Setup and see if "Marketing Users" is checked. If not ask your Salesforce admin to turn his privilege on for you. If you see this warning when dragging an item to the none column in resource scheduling it's because the field you've mapped to Resource will not accept blank values. That's the case for the "Owner" field DayBack uses by default as the resource for Events, Tasks, and Campaigns. You can map this to another field of your own which will accept blank values. FileMaker Web Publishing will pull data from every field on your layout, even though DayBack only needs some of the fields in your table. So to speed up your queries, and to reduce the possibility that bad data is getting sent to DayBack, be sure that the layout specified in DayBack admin's Source Settings only contains the fields DayBack requires. 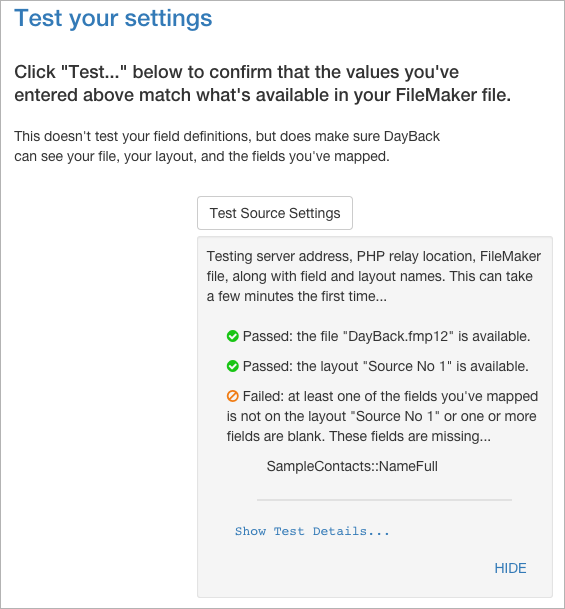 If you click "Test Source Settings" and don't get any results, it is likely because DayBack can't see your FileMaker Server at all. Check that the server address is correct and that XML Web Publishing is enabled for your server. If you get an orange failed sign for the PHP Relay file it likely means your PHP relay file isn't there or is in the wrong place. It could also be that PHP isn't running on your FileMaker Server. If you get an orange failed sign that says the DayBack account doesn't exist in your PHP Relay file it likely means that you have set the variable "$loginByName" to true in PHP Relay file and there is not a match for the DayBack account in the if statement to determine the correct FileMaker account. If you get an orange failed sign on the FileMaker file there are a few things to check. Tip: If you're not getting the correct expected output, such as file not found or a 500 error, try replacing your PHPRelay file with the downloaded, untouched version. If that works, then your PHP service is functioning correctly. Make sure you've used a plain text editor, as mentioned in our docs here. Also, verify that there aren't any commas or quotes that have been accidentally deleted where the file was edited. Once you're getting something more than 1 byte returned in test details or results at the URL above you'll have the PHP relay file in the right place and can make sure the rest of your configuration is correct. If the URL tests above are passing but you still can't get the PHP file to work AND you're using "localhost" in your PHP file, it could be that your server / hosting provider has settings preventing that: try replacing "localhost" with your server IP address. Check the test details to see, for example, that the filename you entered is one of the file names on your server. Only files with XML web publishing enabled show up, so make sure it's enabled for your file. Same thing with layouts: check the test details to see which layouts DayBack can see in your FileMaker file. It's likely that your spelling is wrong (remember that these entries are case sensitive). If you have green lights on your tests but no events I'd check the fields mapped to the "TimestampNum calc start" and "...end" fields. Are these calcs defined to return numbers? Note that if you paste in our example field definition you need to point parts of the "Let" statements at your own date and time fields: double check that you picked the right fields from your table. The TimeStampNum Calc End field is required to be mapped, even if you've disabled it in the settings. If you don't enter a valid field, you will receive the following error when loading the calendar: "There was an error retrieving FileMaker events: 4 - Command is unknown"
This likely means that your "TimestampNum calc start" and "...end" fields described above are returning numbers but the calcs themselves aren't correct or only one of them is (only the start or end calc). Double check the field mapped to "Event display calc" and make sure it's returning a value on your FileMaker layout. You'll see event colors when the values in the field you've mapped to "Status" match the values in the calendar's Status Filters (these are on the Filters tab of the calendar sidebar). If you're not seeing colors it's because the field you've mapped doesn't contain one of the status values in the sidebar. 102 means a "field is missing" so it sounds like DayBack Online is trying to write your event back to FileMaker but can't find one of the fields it needs. This is probably because one of the fields you've mapped got removed from the layout you specified or the field got deleted from your table. I'd return to Source Settings and re-run the tests towards the bottom of the page to see which field(s) this might be. You can also revisit layout you specified (probably "Source No 1" if you're using DayBack for FileMaker also) and make sure the fields are mapped to fields in your table. "Field Can't Be Modified." Make sure that the fields you mapped are writable; that is, not calculation fields. Of the fields DayBack Online asks for, only the three that have "calc" in the name may be calculated fields. If you are using a calc field for any of the other fields, try changing it to a Text field, then set it up to auto-enter a calculated value instead. You might also check that the account you've set up in the PHP relay uses a privilege set with write privileges to all the fields you mapped. Then make sure that the settings you've entered into DayBack are the uppercase version of the format you find here. None of that helped? Please get in touch.